They say food, laptop and internet is all you need to create the next big thing. But a little incentive hurt nobody! 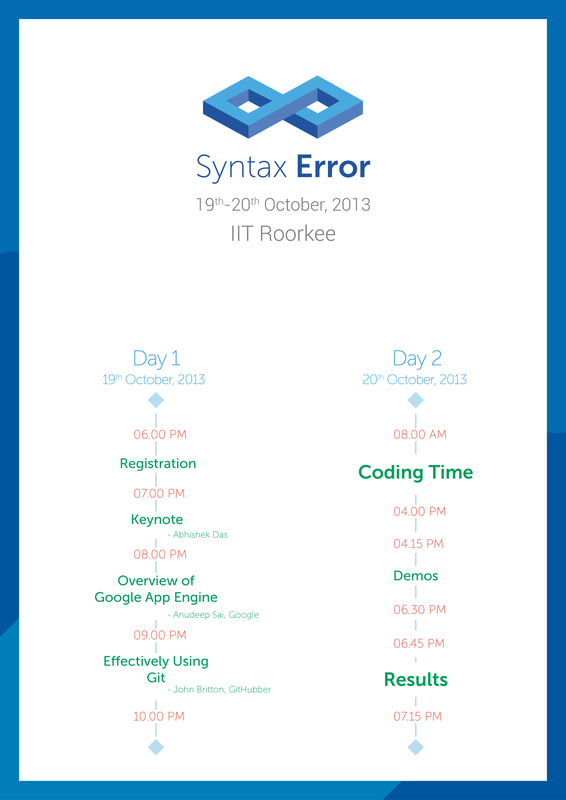 SDSLabs, in collaboration with Google & GitHub, presents Syntax Error, IITR’s first hackathon! Syntax Error will be an opportunity for software legends, innovators and enthusiastic newcomers to get together and push themselves to build awesome applications in 24 hours. Have interesting add-ons or features to existing web products or apps? Or have a cool new product idea itself? Then this event is the perfect platform. Come hack with the best minds of Roorkee and stand a chance to win exciting prizes sponsored by Google and GitHub! The event is invite-only. Registrations are closed. Time-limited coding event. You've got < 24 hours to produce something that works and is impressive. You bring nothing but a laptop and an idea, and hopefully leave with working code. You might want to read this. It's fun! It gives you an excuse to learn something new and challenge yourself. Prove your nerd-fu to the world. What can you do in 24 hours? Find a small problem to solve, that you think you can solve with what you know + 2-3 new things. Find a toolset to use - either one you know or want to explore. Keep your scope limited. Top 3 prizes are for the most complete and impressive hacks. We also have prizes for hacks that don't make it to the top 3 but stand out! For example, best design, geekiest, funniest, hardware hacks, etc.